Free online Sierpinski pentagon fractal generator. Just press a button and you'll get a Sierpinski pentaflake. There are no ads, popups or nonsense, just an awesome Sierpinski pentaflake generator. Press a button – get a pentagon. Created by mathematicians for mathematicians. Super exciting news! I just redesigned my catonmat.net blog. Now it has a new minimalistic design and is entirely powered by alien technology. Check it out! 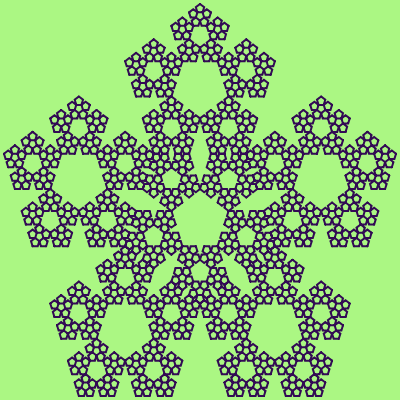 Regular pentaflake Generate a regular pentaflake with five new pentagons in each recursion. Semi-filled pentaflake Draw an extra pentagon in the center of the pentagon. Fully-filled pentaflake Place extra pentagons in the enter of all pentagons. Background Background color for pentaflake. Line color Border line color for pentaflake. Internal color Fill color for pentagons. Line Width Individual pentagon border thickness. Padding Padding in pixels around the entire pentaflake. Direction Turn the pentagon to this side. Sierpinski pentagon generator tool What is a sierpinski pentagon generator? This tool draws Sierpinski pentagons. The Sierpinski pentagon is also known as a Sierpinski pentaflake or simply a 5gon. It's created from a regular five-sided polygon by recursively placing five new connected pentagons at its vertices. This process is repeated as many times as specified in the iterations option. This tool supports two more types of Sierpinski pentaflake fractals – one that places and extra, sixth, pentagon in the center of the pentaflake and another one that places extra pentagons in all centers of all new pengtagons. With this tool you can set the width and height of the pentaflake and colorize it using a custom color palette. The color palette has three adjustable colors – background color, pentagon border color and pentagon filling color. You can also adjust pentaflake's border thickness. Note that if you set it to zero then the fractal will use two colors – background color and fill color. You can also add offset from the edges of drawing canvas and flip the fractal to either side. Mathabulous! 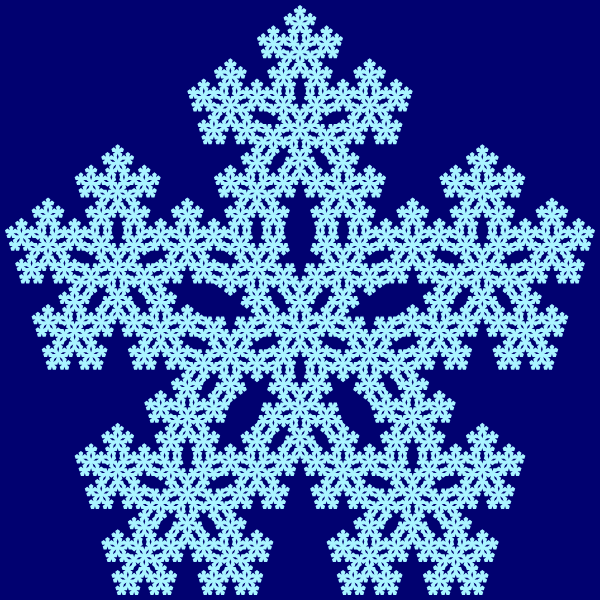 This example generates a regular Sierpinski pentaflake. Regular here means that it's created by placing five new pentagons in each vertex of the previous pentagon. We also turned the pentaflake upside down and set 3 pixels line thickness, 5 pixels padding and 4 iterations. This example uses the same color for filling and background so the pentagon border is clearly visible. We also choose to generate the second type of Sierpinski pentagon that partially fills the center of the original pentagon, and we also use depth 5 for recursion. 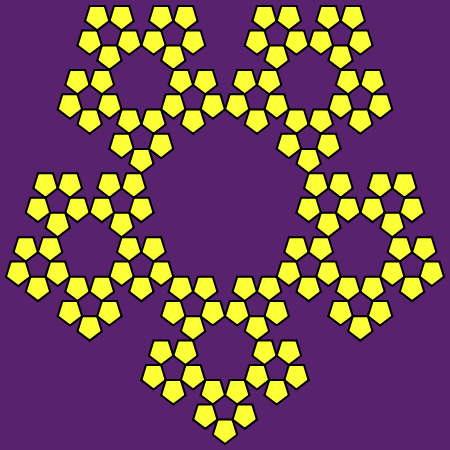 This example generates the third form of the Sierpinski pentagon, which places extra pengatons in the center of all new pentagons, not just the middle one. Pentagon border line thickness is set to zero and it uses two contrasting shades of blue to make the fractal look like a snowflake.